Aiea's Josh Blakemore dragged Castle's Nicolas Rapoza, top, and Kaimana Nakoa across the goal line during Na Alii's victory on Saturday. Cinderella loves to dress in maroon. Or is it green and silver? Either way, Cinderella is alive and well, looking forward to tomorrow night. In Farrington and Aiea, the underdog shines brightly in the Oahu Interscholastic Association football playoffs. Farrington is coming off stunning wins over Leilehua and Mililani, turning a 3-3 regular season into a carriage ride to the big ball. 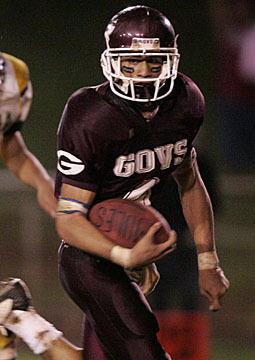 The Governors (5-5) can secure a state tournament berth with a win over No. 1-ranked Kahuku at Aloha Stadium. Kickoff is set for 7:00 p.m.
Kahuku won the regular-season matchup between the two teams, 43-0, on September 30 at the Red Raiders' field. "We're trying to tell them forget the game. It's a new game, new season," Kahuku coach Siuaki Livai said. "Farrington is 2-0 and we're only 1-0. Farrington is playing big time. They're a very improved team right now in all phases of the game. They're a lot more confident now." Farrington quarterback Elijah Filifili was spectacular in the win at Mililani, passing for 348 yards. Kahuku's elite corps of linebackers and D-linemen, however, stifled the league's top offense, Kapolei, in last week's 47-7 win. "You can't take anything for granted. Just gotta keep doing what we need to do," Livai said of his defensive unit. Malosi Te'o, who began the season on the bench, broke out with 193 yards against Kapolei. He and Kamuela Alisa give Kahuku the best 1-2 backfield tandem in the state, and their offensive line graded well. "Maybe not A-plus, but they scored high," said Livai, who teaches algebra at the school. Castle's stunning loss to Aiea drew a strong response from the Kahuku community. Castle is the only team that gave the Red Raiders a defeat this season. "Aiea is awesome," Livai said. "Out of respect for Castle, we wish we had an opportunity to play them again. Aiea proved to be the better team, but I don't even wanna look that far. Farrington is right in our face and we need to figure out a way to beat them." Kenneth Faumui and the Farrington Governors take on the top-ranked Kahuku Red Raiders tomorrow at Aloha Stadium. Aiea, meanwhile, continued its late-season offensive barrage. Wide receiver Josh Blakemore had a breakout game in the 52-31 shocker over Castle. The win sent Na Alii into the semifinals, where they will face sixth-ranked Waianae. Kickoff is slated for 4:30 p.m. at Aloha Stadium. Aiea (7-2) entered the Star-Bulletin Top 10 for the first time this week, landing at No. 9. Na Alii aren't the same team that lost to Waianae 25-6 on September 16. As rough-and-tumble as the OIA has been -- the league's highest-ranked teams two weeks ago were Mililani and Castle -- the Interscholastic League of Honolulu offers another set of intriguing matchups. Iolani may be reeling, but the Raiders are still in position to win the ILH Division II title. However, the Raiders face a bigger, stronger squad again. Damien is coming off a near-upset of Saint Louis and has the manpower in the trenches to make life miserable for the quick Raiders. Kickoff at Iolani is set for 3:15 p.m. tomorrow. The Raiders, ranked eighth, were ranked No. 2 in the state at one point until a string of losses to the ILH's Division I powerhouses. That includes a 24-20 loss to Punahou last week. Iolani is 3-3 in league play, including a 24-7 win over the Monarchs on September 24. Damien, 2-4 in the ILH, needs a win in this regular-season finale to force a playoff with the Raiders for the D-II crown. Iolani's defense "limited" Damien's Kealoha Pilares to 127 rushing yards on 26 attempts in their first matchup. Raiders ace Kiran Kepo'o passed for 257 yards on 20 of 28 accuracy. The ILH's Division I race has the potential to be a Tylenol Special for schedule makers. Kamehameha, ranked No. 2 in the Top 10, leads the league with a 5-1 record (8-2 overall). The Warriors can seal the ILH title by defeating fifth-ranked Saint Louis, which is 4-2 in league play, on Saturday night. However, if Saint Louis (6-3 overall) wins, it will force a tie with Kamehameha. In addition, Punahou can pull into a tie with Saint Louis and Kamehameha with a win over Pac-Five -- and only if the Crusaders beat the Warriors. In that scenario, all three D-I teams will have 5-2 records in league play. Don't think it can happen? Think again. Saint Louis upended Kamehameha 21-14 on September 30. Saint Louis stood up to Kamehameha's usually stout rushing attack, limiting the Warriors to 174 yards on 24 carries. Offensively, the Crusaders' Camerons were on point that night. Cameron Higgins passed for 202 yards, targeting senior classmate Cameron Bayne nine times for 150 yards. Cody Wells, who rushed for 66 yards, scored a game-winning 1-yard touchdown with 30 seconds left. Kickoff for the Kamehameha-Saint Louis rematch on Saturday is 7:30 p.m. at Aloha Stadium. The Neighbor Islands also have their share of excitement this weekend. Waimea can return to the Kauai Interscholastic Federation football throne tomorrow with a win over the Kauai Red Raiders. Playing at comfy Hanapepe Park is a huge plus for the Menehunes. At War Memorial Stadium in Wailuku, No. 7 Lahainaluna (8-1, 7-1 Maui Interscholastic League) needs a win over Baldwin on Saturday to force a first-place tie with the Bears. Fourth-ranked Baldwin, behind senior quarterback Kalehua Moniz, leads the league with an 8-0 mark (9-0 overall). The OIA Division II playoffs are on hold this weekend, with the title game set for next week between Radford and Moanalua. The Big Island Interscholastic Federation is also on hiatus for a week. Kamehameha-Hawaii is in position to qualify for its first football state tournament. The run-and-shoot Warriors will host a vastly-improved run-oriented Konawaena squad next week.